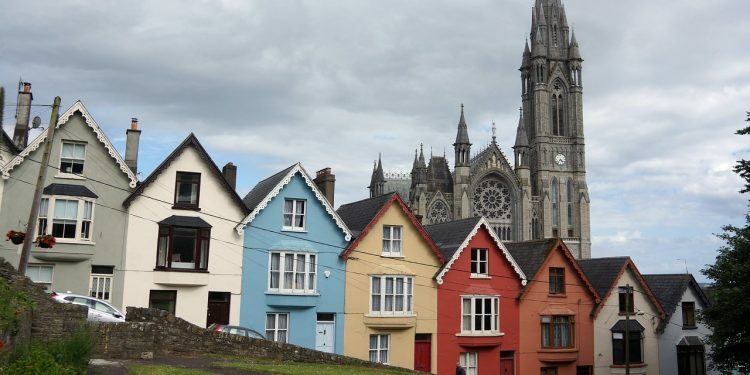 Cork, the friendly Irish rebel city by the River Lee is well worth a visit. The gale is howling like a banshee outside my window with the rain rattling on the casement panes. Temperature wise it isn’t much different from Edinburgh but wetter and breezier. The flags by Cork airport are fully extended as the planes take off in to the wind through the enveloping mist. The south coast city of Cork on the banks of the River Lee with a metro population of several hundred thousand is the island of Ireland’s third city after Dublin and Belfast. It was known historically as the`Rebel City`because of its support for the Yorkist cause during the wars of the roses (1455-1487). A strongly nationalist city, Cork was burned down in 1920 by the notorious `Black and Tans` during the Irish war of independence (1919-1921). Despite Ireland becoming more secular in recent years, churches are still well attended and my taxi driver blessed himself every time he drove past a Catholic church. 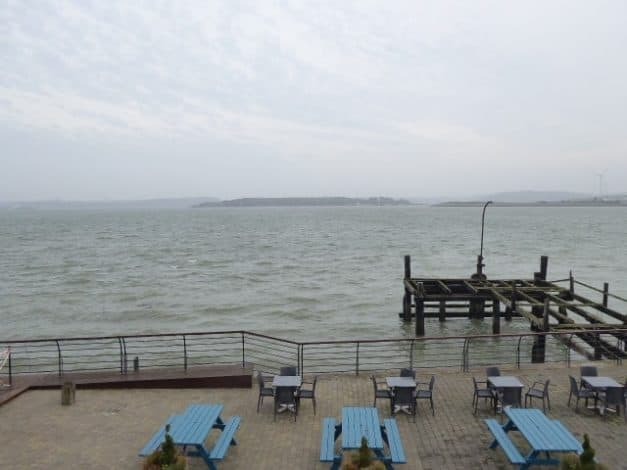 Cork Harbour rivals Sydney Harbour as the world’s finest natural water front. It’s a beautiful, impressive and fascinating area, full of history and natural beauty. The land area in the centre is Great island, home to the town of Cobh and connected to the mainland by two bridges, one road, one rail. Less than two kilometres separate the headlands as it meets the sea, making it by any reckoning, a fine, strategically important natural harbour. Its considerable depth in many places allows large ocean-going vessels – tankers, container ships and liners – to enter and depart with ease. The port of Cobh (pronounced `Cove`), formerly known as Queenstown, was an embarcation point for over a million Irish emigrants in the 19th and early 20th centuries. There is a pier by the old White Star building called `Heartbreak Pier` where many starving, desperate people took to the seas in the hope of escaping grinding poverty by immigration to the new world. Many thousands of them went to Australia. `Heartbreak Pier` from which over a million destitute Irish emigrated in the 19th and 20th centuries – many to Australia. In the background is Spike Island a former military base and now a tourist attraction. Heartbreak Pier was also the departure point for the 123 passengers who boarded the ill-fated Titanic in 1912. This gigantic ship was too large to come in to the harbour and the passengers had to be carried out by two tenders called PS Ireland and PS America. 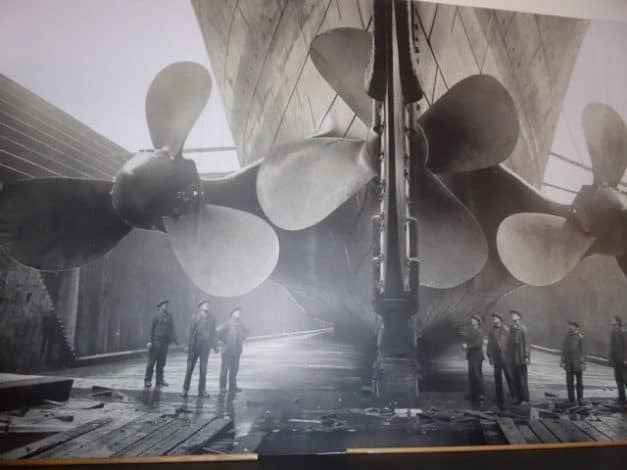 Compare the size of the huge propellers of the Titanic with the size of the workmen. The Titanic Exhibition is in the original White Star Line Ticket Office, a building steeped in history dating back to the early 19th century and the departure point for many thousands of White Star Line passengers. When you arrive at the check-in you check in at reception and are told the story of those 123 passengers. Upon check-in you are given your boarding card. Your boarding card will have the details of one of the 123 passengers who came to the White Star Line Ticket Office on Thursday April 11th, 1912. These were the final passengers to join Titanic at her last port of call in Queenstown, Ireland. Titanic sailed from Southampton, England via Cherbourg, France to Queenstown, Ireland. (Cobh was renamed Queenstown from the period of 1849-1921 in honour of Queen Victoria’s visit to Cobh and so is referred to Cobh as Queenstown for much of the story). The pier, which is believed to be about 150 years old, earned its nickname from the poignant scenes it witnessed. As many emigrants did not have the means to return home to visit once they left Ireland, it became known as Heartbreak Pier, representing the heartache of a final goodbye to family and home. I was given the ticket of William Docherty a 22-year-old local man who sailed off to America to seek a new life. I had to wait until the end of the tour to find out his fate. The tour takes you through reconstructions of the third-class cabins which while modest by today’s standards had features like electricity and running water which many rural folk in Ireland would not have had at the time. The first-class cabins were plush and the dinner menus exotic. The rich passengers had access to Turkish baths, libraries, fitness suites, first class restaurants and were able to send messages long distance by the ship’s state of the art wireless transmitter. There was a 3D hologram of an actor acting out the part of a victim which was poignant. The tour ended with the list of all the passengers who had embarked at Cork. Of 123 just 44 survived, the two women first-class passengers were saved but William Docherty my steerage (third class) passenger perished along with 79 others. 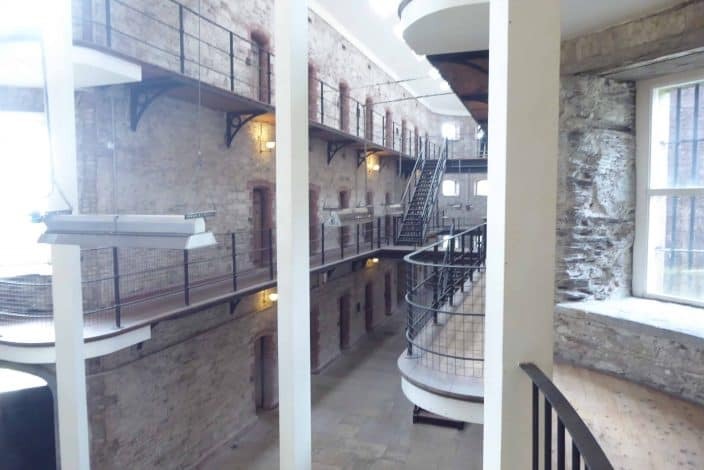 Cork has many museums and art galleries but the one attraction I wanted to see was the historic Cork Gaol. A tour of this this 19th century prison is an arresting experience. The dreadful conditions inside don’t bear thinking about with flogging, overcrowding and insanitary conditions. Inside the notorious Cork Gaol which closed in 1923. Conditions were awful. Escape attempts resulted in the prisoners’ clothes and blankets being confiscated which meant they froze in their cells lying on straw as there were no beds. The work was demeaning and laborious with prisoners having to pick oakum which meant pulling apart old ropes to make new ones. The strain on the fingers led to many bleeding fingers and blisters. There was a treadmill on which unfortunates had to trundle all day. Sent to prison for petty offences like stealing food, those who were sentenced to five years or more were deported to a life of penal servitude in Australia in ghastly `coffin ships` as this was cheaper than keeping them in prison. One of the most famous inmates in October 1919, was Constance Markievicz. An Irish nationalist and suffragette, she was the first woman to be elected to the British Parliament, and was imprisoned at Cork Gaol for making a seditious speech. The gaol was finally closed in 1923 and the building was then used as a radio station until the late 1950s. The building was then left derelict for decades until it was opened in 1993 as the current historic tourist attraction. One of Cork’s best-known attractions is the large English market which is principally a food hall. The strong smell of raw fish may be off putting for some though. Other attractions include the butter museum, the Cork public museum and the Crawford art gallery. Horse racing and gambling are popular pastimes in Ireland and Cork has a trio of Gold Rush casinos. The city’s main railway station Cork Kent is named after Thomas Kent who was an Irish nationalist leader who was executed by the British in 1916 in the aftermath of the Easter Rising in Dublin in Cork on 9 May 1916, the only person outside of Dublin to be shot for his role in the events surrounding Easter Week (Roger Casement was hanged for treason in London later that same year). Enough of history, how about going out? Cork is a byword for great food, and there’s a good reason why: the quality here is incredible. Step into the English Market and you’re right in the middle of a locavore’s paradise with artisan cheese, sublime smoked fish and creamy chocolate among the buzzing food stalls. Flavour, quality and innovation drive a vibrant restaurant scene that sees favorites such as Café Paradiso and Farmgate Café sit alongside buzzing new hotspots of Electric, Salt, Miyazaki and Elbow Lane. With its strong Oz links, Cork is an ideal and fascinating holiday destination for an Aussie. Travelling from Britain by rail and sail is time consuming with for example a trip by train and ferry from Edinburgh to Cork taking 14 hours by train, ferry and train again. Aer Lingus does the same distance with a direct flight which covers the 354-mile distance in one and a half hours on their ATR 78-seater turboprop. You’ll love the colleens in their bright green uniforms and friendly manner. Cork, the friendly rebel city by the River Lee is well worth a visit.